In England and the USA, ‘Kenny’ was the more favoured shorter version of Kenneth, Kendrick or Kendall. It’s one of those names that although never really popular, remained consistent in the mid to latter part of the 20thcentury. Adelaide’s Ken McGregor, named in the forward pocket in this team, was the last Ken to play VFL/AFL. Who was the last Ken before him? I used to love watching North’s Ken Montgomery kick a drop punt out of the back line with his thumbs behind the footy, ala Carl Ditterich. Carlton’s Rod ‘Curly’ Austin also favoured the same technique. Will we ever see another Ken or that kicking style ever again? Fremantle, Gold Coast, GWS, Port and West Coast have not had a Ken represent them in the VFL/AFL. Who would coach this team of Kens? Judge, Hands or Sheldon ? I nominated Sheldon because he took on the basket case that was St Kilda in 1989 and made them a team to be reckoned with during his tenure. 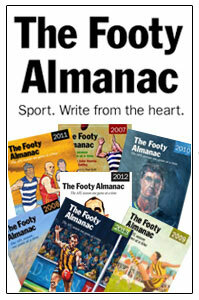 Almanackers, here is your chance to nominate your favourite Kens from Australian Football. Nominations outside the VFL/AFL always welcome and encouraged. Umpires: Incredibly, no one named Ken has umpired a VFL/AFL match in 123 years. Ken Hinkley says hi Phil. Kenneth George (KG) Cunningham can umpire, and might get a berth in the cricketing Kens too. English popsters Kenny can be the support act. Doh Swish ! And I had him down on the paper. Bloody hell, I must be getting old. Did Ken Boyd play full back? I thought he was a bone-head ruckman whose claim to fame was knocking out John Nicholls and then admitting it. Ken Farmer MUST start at FF. Ken Eustice on a wing or HB flank. Anyone but KG (Ken) Cunningham to umpire. I need to hand in my SA passport after forgetting Ken Farmer. Thanks Rabs. 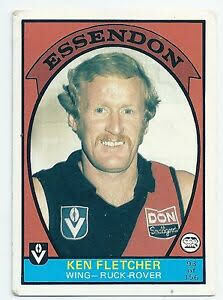 Former Essendon (48 games) and Woodville rover Ken Mansfield is a glaring omission. Had “Mans” tattooed inside his lip. Keep it going Phil, those names bring back memories of a bygone era(s). Geelong had 3 Ken’s in the 1960’s. You mention Newland, & Goodland, though there was also Ken Gladman. Ken Frost could have been a star cricketer (state schoolboy champ) but decided to concentrate on his first love, baseball. Initially an excellent first sacker, he developed into an outstanding third baseman with a tracer bullet like throw across the diamond. In the ’60 Claxton Shield series held in Adelaide, Frostie took a superman in flight like catch to halt a NSW charge to virtually win the Shield for the home state. Ken was also a long ball hitter and plonked many homers for his beloved Goodwood Indians. Ken’s 2 sons followed in their father’s footsteps as quite superb sportsmen in their own right. Ken Frost, Doug othams and especially Peter Box were my boyhood sporting idols. Smokie – No love for ‘Footloose’? Wally – I reckon Boyd played as a ruck/back pocket. Seeing as there was a dearth of Kens for fullback, I gave him the spot. Rabid – Ken Farmer an excellent nomination. Kicked a ton for North Adelaide 11 seasons in a row. That’s huge. McAlmanac – Top lip or bottom lip ? That’s tough. 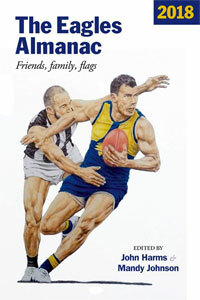 In the 1956 Grand Final between Melbourne and Collingwood , Ken Melville represented Melbourne. Collingwood had 3 Kens in the side: Hedt, Smale and Turner. Ken Greenwood was a ruckman with Carlton, then Footscray. He played in the losing Carlton GF team in 1962. When Footscray played at Geelong in 1970 Doug Wade struck him getting 2 weeks. Later that season Carl Ditterich hit him at Moorabin,also getting suspended. Ken Greenwood trod on some toes that year. Oops – it was the 61 Claxton and not ’61 that Frostie’s catch won the Shield for SA. Incidentally, Adrian Pearce, who eventually took over as SA’s star third sacker, was a spectator at that series and was in absolute awe at Frost’s catch. Should the team enjoy old westerns, Ken Maynard films could be the go. Kenny Whelan was a fabulous exponent of the “specie” and had 2 hundred goal seasons for Jack Oatey’s beautiful Sturt side of the early 70’s. Footy as it’s played in heaven. Ken left us too young in 2013. 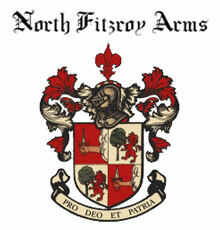 Hey Fisho, it turns out that I’ve known Ken Frost’s son for nearly 35 years, without knowing about his dad. Ken Whelan AND Ken Noath – is that a Thin Vin Twin Spin eh Swish? Remember the Liverpool String and Vocal Quartet? They could play a bit. Salah, Mane, Firmino and Van Dijk haven’t got a patch on them. Not to forget the other Ken McGregor (can someone confirm the most recent Ken’s grandad), more famous as a tennis player in the ’50s but also played 58 games for West Adelaide and four games for South Australia. Rumours that West Adelaide selected him ahead of someone named Pavlich and lived to regret it are not true. Shout out to the mighty Hawks head trainer, Ken Goddard, who was with the teams through the 70s, 80s and 90s. A Hawks Hall of Famer no less. Honorary mention to Ken of Ken and Barbie fame. Mattel really saw the future giving the toy doll the mantle Ken. 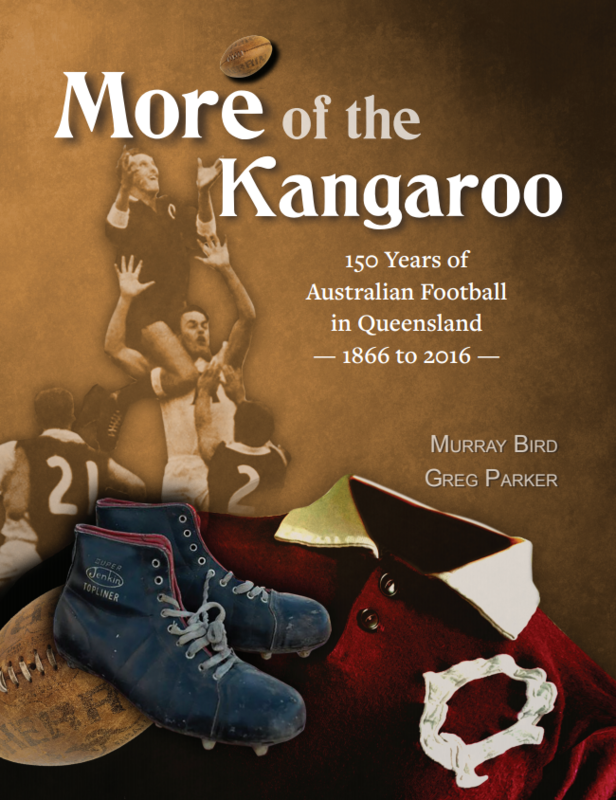 And if anyone is commissioned to make the documentary about Australian rules football please can it be Ken Burns? Don’t forget Sir Kenneth Luke. President of the VFL with the highest stand in the land (which still stands) named in his honour..
Glen ! – Ken Greenwood hey? Badge of honour being struck by Big Carl ! He must have done something really bad. Fisho – Thought about Kenny Everett. Some of the funnier sketches around esp the ones including Billy Connolly. PB – Kenny Whelan a beauty. 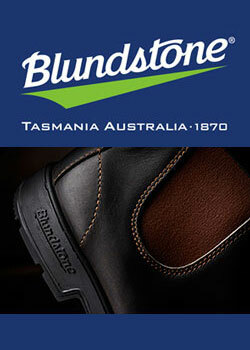 Forget the Thor guernseys and bring back the lace-ups ! Terrific footage. Swish – The Ken Oath Orchestra ? Only at The Footy Almanac. Dave – So there was an older Ken McGregor ? The plot thickens. Rick – Ken Goddard, head trainer through another Hawks golden era. The amount of champions he helped along the way. Great nomination. Damo – Yes, Sir Kenneth Luke former Carlton power-broker who foisted VFL Park upon us. Not one of his greatest ideas. Fisho – Ken Berry a ripper. Chris Kenny is be nowhere near this team. Great stuff Phil, and loving the comments. Loved that intro to F Troop Phil, I was likewise a devoted fan as a youngster, I seem to recall that Ken Berry passed away recently, leaving Larry Storch as the only surviving star of the show and he’s well into his 90’s, one of the classic comedies of our time, cheers! Hey Phil, i take it we share a common opinion of Chris Kenny. His relation Mark Kenny (I’m not sure if he’s a brother or cousin) is much more balanced in his opinions and could vie for the team’s centreman. F Troop sure was great fun and a classic among the classics. Ken McAullay East Perth. Tassie Medal in the 1972 carnival… his performance on Peter McKenna was one of the great defensive displays. Simpson Medal 1972 WAFL grand final & WA vs Vic. Also an opening batsman for WA. Phil – Never mind VFL Park, In the early fifties Kenneth Luke was lobbying for Princes Park to be used as the main stadium for the 56 Olympics rather than the MCG. Were it not for John Cain Senior he may well have got his way. If he had Princes Park may well have become VFL headquarters and a major finals venue. VFL Park may have been in a high rainfall area at the edge of town with no public transport but at least it wasn’t Carlton’s home ground!